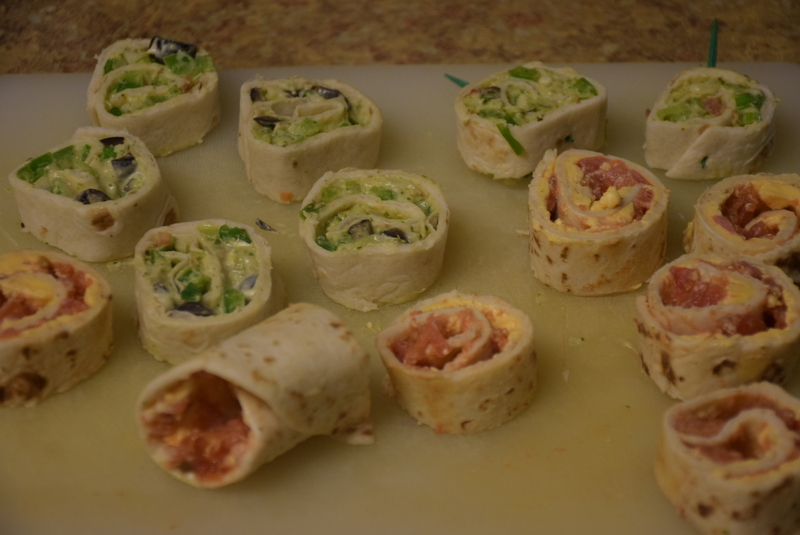 Hello readers, today I am sharing one of my failed experiment with you all.I call it failed because I initially intended to make tri-color layered pinwheels out of them, but because of some blunders , I ended up with just singular colored pinwheels. Anyways they tasted good like always ! 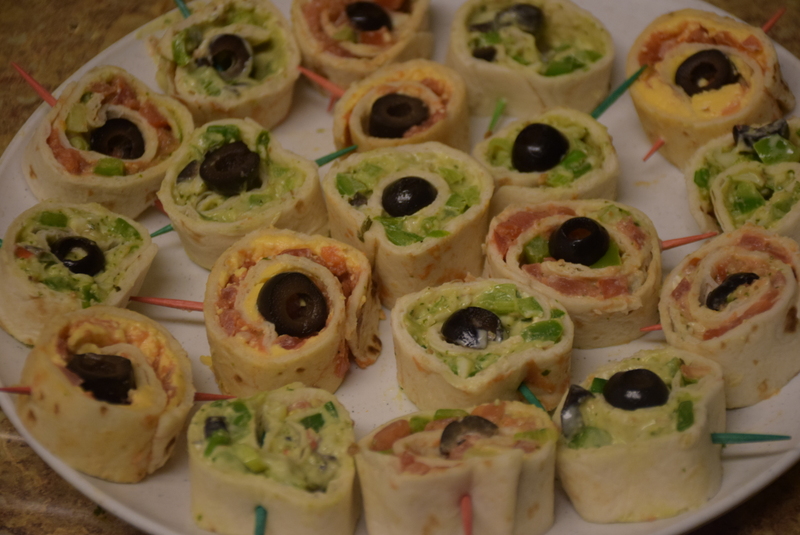 Also, if you are looking for a party or pot-luck appetizer served cool, then this is the right choice. 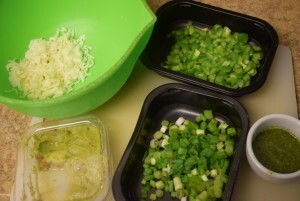 So I would script my original recipe with some do’s and don’ts which will guide you to the perfect 3-layered recipe I imagined. Also towards the end , I would share some ways to rectify any mistakes. 1. Please make sure to buy the largest available Flour tortillas for this recipe. You may use roomali roti too. I am saying so, because it is easier to roll and spread on them. 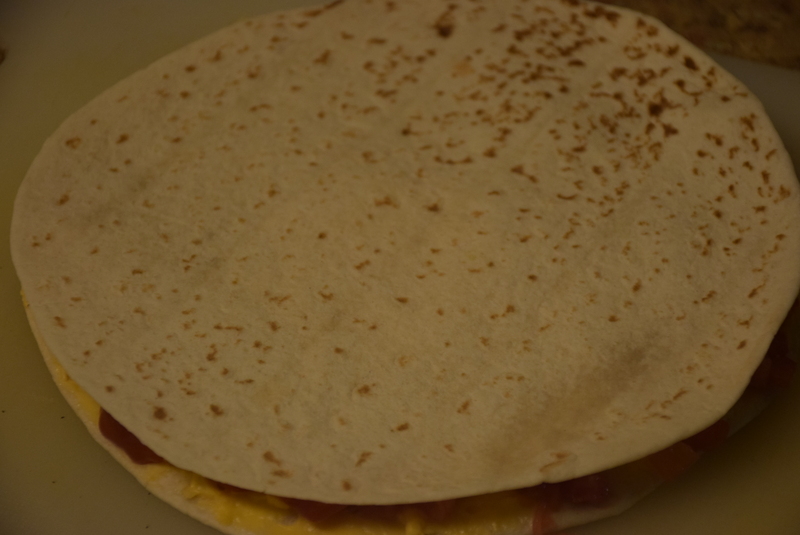 So the first reason of my failure was I used 6-8″ tortilla. 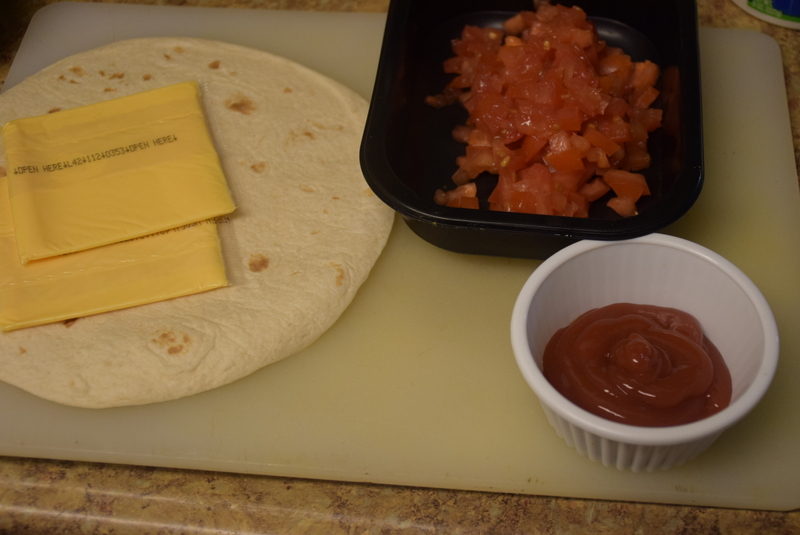 Also you may use flavored tortillas like spinach flavored or tomato flavored for boosting the color of this recipe. Lay it flat on a board. 2. Now add the green stuffing prepared by mixing the mozzarella cheese, capsicum, spring onions, guacamole and coriander dip. You may adjust or skip the quantities of each according to your taste and preference. I have used less cheese ,because I like it that way.Similarly prepare the white stuffing by mixing the Ranch and black olives in a separate bowl. 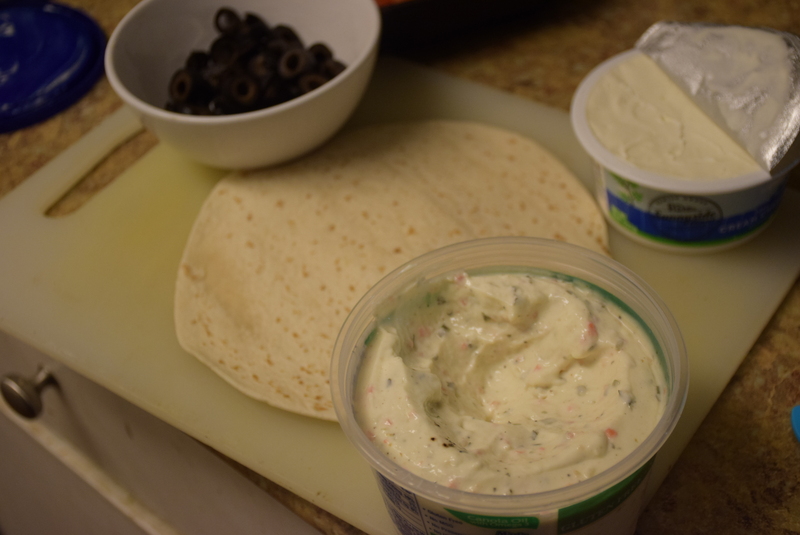 If you want pure white color just skip the black olives. 3. 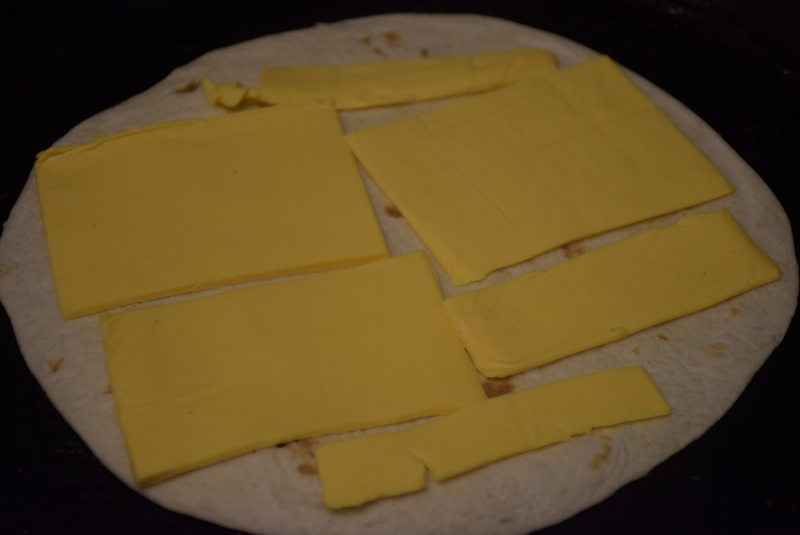 For the red layer, place the american cheese slices on the tortilla and warm it on a griddle (tawa) for 1-2 mins. Make sure not to overheat the tortilla on medium or high flame or it might get hardened up and would not roll. 4. When the cheese starts melting , take it out on a board and add 2 tbsp tomatoes in the center and spread them evenly with a spoon. 5. 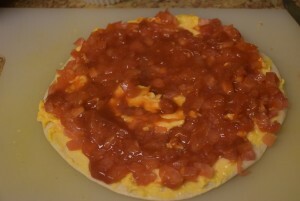 Now pour some ketchup in patches all over and then spread it with another spoon to form a thin visible red layer. Here I would like to add , that if you wish to give it an orange color, you may add some shredded carrots too with tomatoes. 6. Now Take another tortilla and place it on a board. This is the next mistake I made. I placed it directly on the top of red layer. 7. 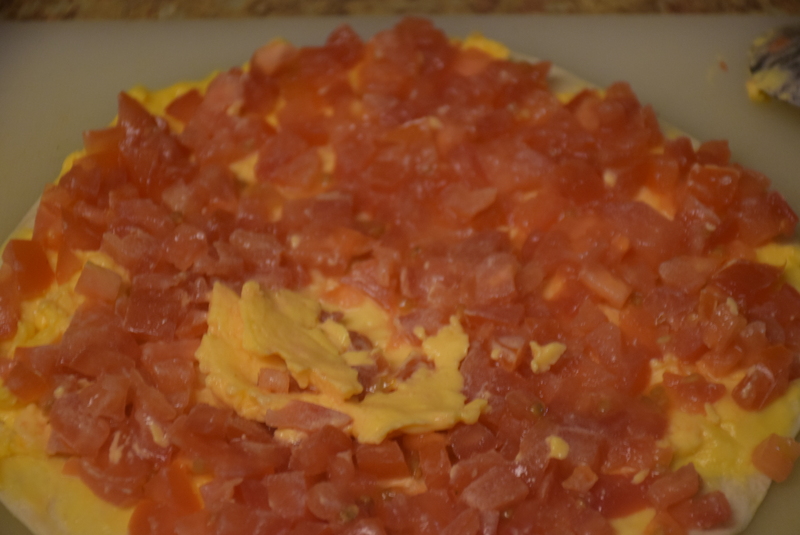 Top it gently with some cream cheese as much or as less as you want. 8. 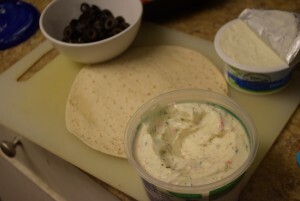 Now place a dollop of black olives and ranch mix in the center and spread it neatly in a thin layer. 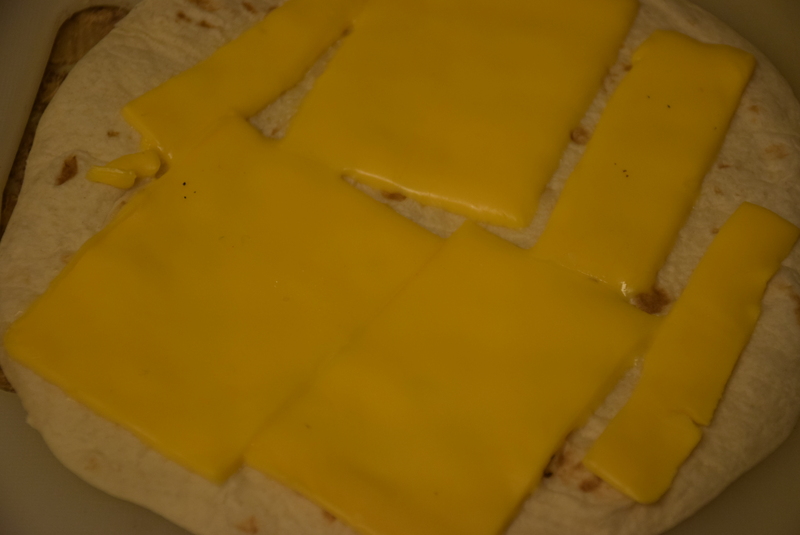 The reason I am saying thin layer, because thick layering will make the rolling difficult. 9. Take another Tortilla and again place it on a board. 10. 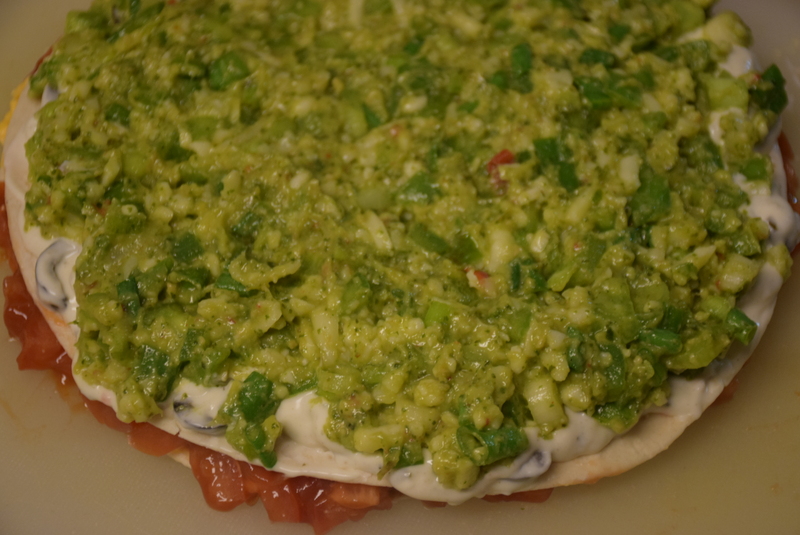 Now place a dollop of green stuffing and spread it gently with a spatula or spoon on it in a thin layer. 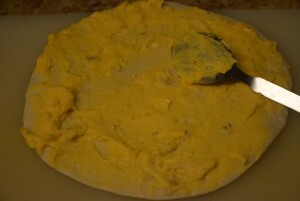 Also while making stuffing keep in mind, that the stuffing should not be too moist or it will make the tortilla very soft , moist and difficult to roll. 11. 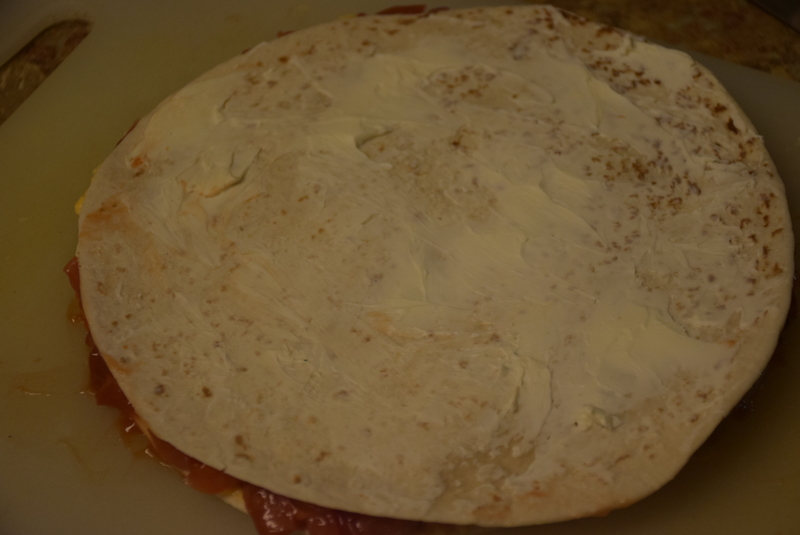 Now take a greased parchment paper or plastic wrap and place the red layered tortilla on it.Then the white layered tortilla on its top and in the end, the green layered tortilla on its top. 12. Insert a toothpick at one side or edges of the 3 layers. Pick the other edge with the parchment paper and start rolling all the 3 in one log. 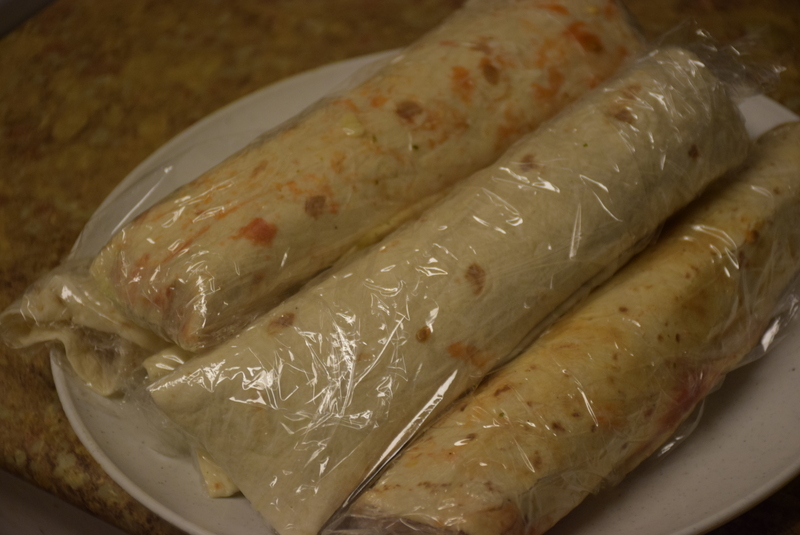 Remove the squeezed out stuffing which could be used while making sandwiches or for making another roll. 13. The log thus rolled would be quite thick . But the 3 layers will be visible. 14. Wrap them in plastic cling wrap and refrigerate them for at least 30 mins or for overnight. 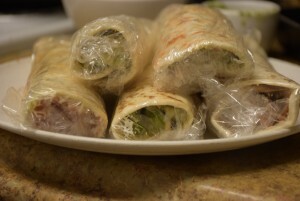 15.Simply roll the individual rolls like I did, and then wrap and refrigerate them. Here it is essential to chill them , since it helps in easy cutting of pinwheels. I took them out after 4 hrs. 16. Cut the ends with a serrated knife and just eat them right away.. 😉 or save them in a separate plate. 17. 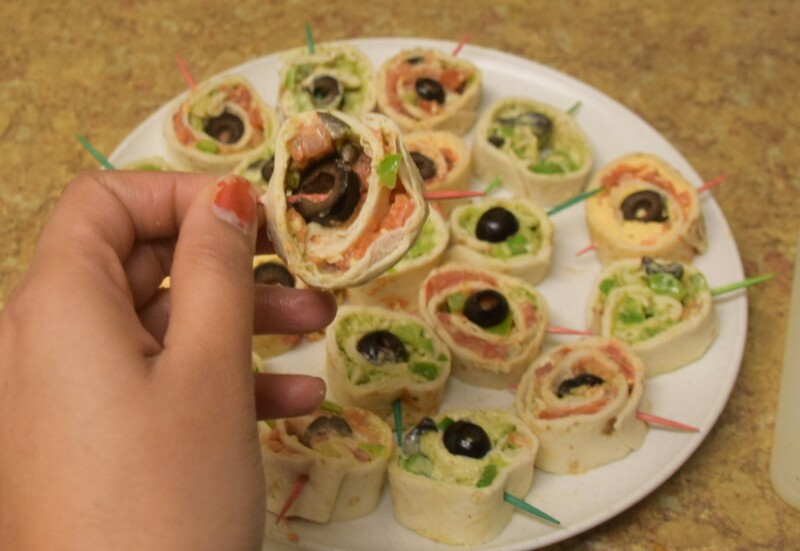 You may stick the pinwheels with the stuffing with colored toothpicks, if you wish. 18. 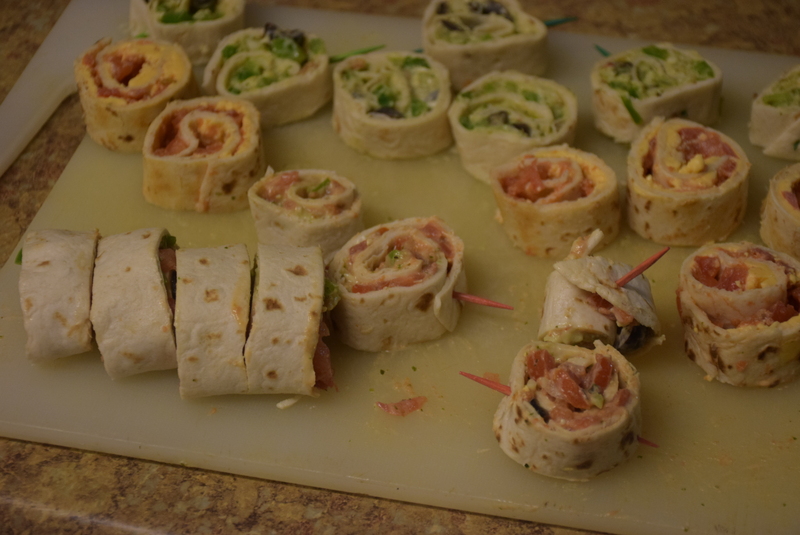 Serve them as they are or with a dip of your choice and some cold drink. 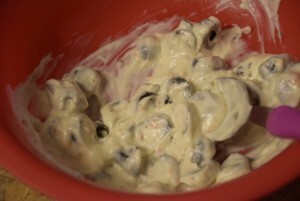 I saved some black olives, which I used for garnishing in the end. 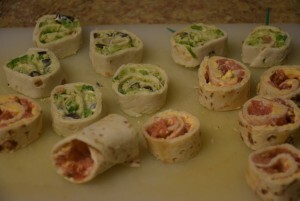 This entry was posted in Appetizers, Food, Kids- Favourite, Raw preps, Recipes, Snacks and tagged American, Carenshare, cheese, cream cheese, easy, Guacamole, in large quantity, mexican, mint dip, mozzarella, non-baked, Pinwheels, prepared in advance, raw, rolls, Roomali roti, salty, shweta jindal, sour, spicy, suitable for independence day, tortilla, Tri-color, yummy, zindagisikhati.